Spring has sprung and that means it is time for the age old tradition of spring cleaning. But this year, Beyond the Bomb is looking to dig in deep and tackle a mess that has somehow escaped year after year: US Nuclear Policy. Join us and our partners in the United Against Nuclear War coalition as we meet with Members of Congress while they are home. April 22nd is Earth Day, a time to reflect on the importance of our planet and make sure we are working to protect it. What better way to honor Earth Day than by getting out and talking to your Representative about common sense policies that would make the world safer? Right now, there are several pieces of legislation on the table to do just that, including Representative Adam Smith and Senator Elizabeth Warren’s No First Use bill. Join up with other anti-nuke activists to let Congress know that nuclear war can never be won and should never be fought. Sitting down face-to-face with your Representative and sharing your story of why you want to prevent nuclear war is one of the most powerful tools we have as constituents. If you’ve never lobbied before, don’t worry! We will provide training and materials to make sure you feel prepared to have a successful visit. At the end of the day, their job is to listen to us. Join in this week of action with others from your community and across the country to pass legislation that makes us all safer. The Earth will thank you. Take the Pledge for No First Use! Call Your Representative to Support No First Use! 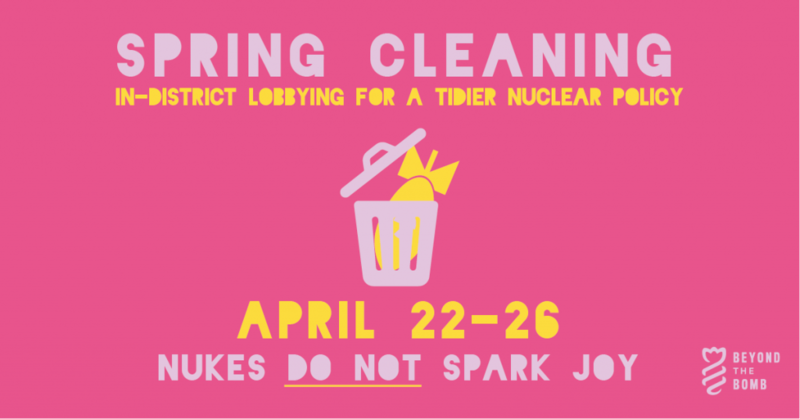 Join us for an in-district lobbying week to begin to tidy up our nuclear policy.